Seasons Greetings – the holidays are here! From Spinach HQ, we hope you had a great Thanksgiving (and by that I mean a play by play of turkey-nap-pie-nap-football-turkey). We were so busy celebrating around the Northeast last week that we didn’t get you a turkey message, but oh boy do I have some good resources for you now. First I want to tell you about an article I read last week because I think it’s useful. The NY Times discussed how turkey grease contributes to sewer overflows and water pollution. I hope you didn’t put your turkey grease, aka FOG (that’s fat, oil, and grease) down the drain (if you did that’s only strike one). Nowadays there are grease recyclers, most of them in major cities, that pick up FOG and turn it into biodiesel! Now that’s cool. Here’s what the NY Times blog said. Now that Thanksgiving is over – its Mariah Carey Christmas album season (seriously how is that album still popular?). Or in my case, time for my daily rotation of Christmas sweaters. Below I have an early holiday treat for you. Your guide to holiday gift ideas and practices that have little impact and benefit the environment. Please share this with your friends and family. When choosing lights for decorating your home, choose LED lights- they use 90% less energy than normal lights and it will save you money on your electric bill! Make recycled ornaments- it’s a great project to do with your kids! If you receive a present you aren’t in love with, donate it to a local charity instead of hiding it in your closet or throwing it away! “20+ Ways to Give Without Giving ‘Stuff.’” The Daily Green. “Great Green Gifts for Pets.” The Daily Green. “9 Tips to Keep Holiday Shopping Sane (and Green).” The Daily Green. “Green Holiday Tips.” Sierra Club. “Recycled Paper and 4 Other Alternative Gift Wrapping Ideas.” The Daily Green. “Which is Greener, a Real or Fake Christmas Tree?” The Daily Green. “How to Have a ‘Green’ Christmas.” Eartheasy. 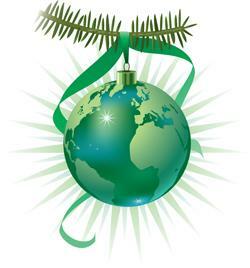 “10 Last-Minute Green Holiday Ideas from Our Facebook Fans.” The Nature Conservancy- Green News. Stay tuned for news on the newest members of the Spinach Team.